There is no better way to reignite the fire in your marriage than presenting your loved one with an eternity ring on an anniversary, or just out of the blue if you’re the ultra romantic type, but when is the right time to say “I Do” again? The Wedding industry is a multi million pound industry. From the very start when potential fiancées are searching for the perfect engagement rings to the big day when the dress, the cake and even the chair covers come into play. It doesn’t stop there though as the renewing of vows is becoming an ever increasing trend in amongst the wedded couples. Until their recent separation celebrity couple, Heidi Klum and Seal renewed their vows every single year! That’s not to say that renewing your vows on an annual basis is the way forward but renewing your vows is something that you are considering doing then an eternity ring is a fabulous addition the renewing of the vows ceremony. When considering what metal to go for you need to decide whether you go for an eternity ring that matches your wedding and engagement ring or to go completely different. There are pro’s and con’s of both and if you’re buying an eternity ring for a partner this decision can be even more difficult! 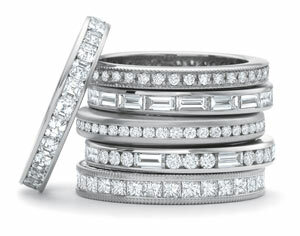 When choosing a style, the traditional options are a full eternity rings and half eternity rings. A full eternity ring has stones all the way around the band where as a half eternity ring has stones set across the top of the ring. Eternity rings as a whole come in an array of shapes and sizes however the most important thing about an eternity ring is not the way it looks but what it signifies. Presenting your loved one with an eternity ring shows a sign of love and devotion so no matter which style you go for, the underlying meaning is what will shine through.